What Is Bleed? 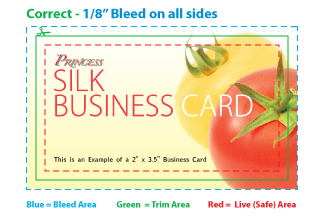 - ColorFX Inc.
A bleed is when an image extends beyond the trim edge of the product by 1/8″. 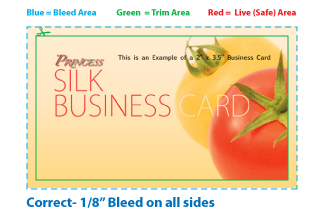 If your image is not white on all four sides, you MUST include bleeds in your files. If your art does not include bleed, when printed and cut, white strips of unprinted paper will appear at the edges. Next How do I know if your graphics department will set up two-sided artwork correctly? Previous What are print-ready files?